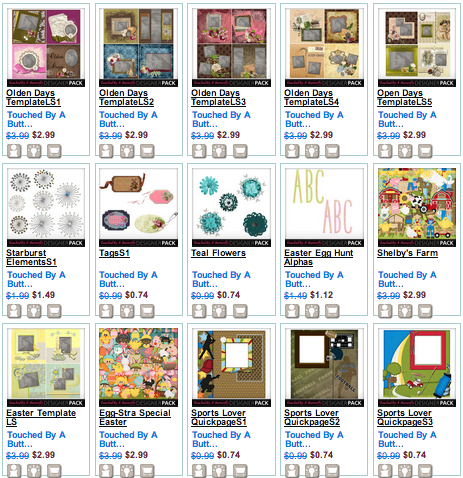 MyMemories Blog: No Foolin' - we have a new Featured Designer! It's Touched by a Butterfly! No Foolin' - we have a new Featured Designer! It's Touched by a Butterfly! Good morning and Happy Monday!! It's always fun to get to introduce (or reintroduce) another of our amazing MyMemories Designers to you! This week, we are excited to show off the goodies from Celeste in the Touched by a Butterfly shop at MyMemories.com! My name is Celeste Lombas. I am currently living in Panama City Beach, FL. I have been a paper crafter since I was a little girl. I have found a new love of digital scrapbooking. I take great pride in the products that I make. I hope you enjoy my digital kits to showcase your memories. And I have THREE great prizes this week!! Comment below and tell me YOUR favorite kit in my shop!! I will have these great prizes for three Lucky Ducks - posted next Monday! Touched by a Butterfly CHALLENGE! ... and don't forget to make a memory today!! Grannie's Treasures is a gorgeous kit, would love to be entered into the giveaway. I would have said the Steampunk Album, however, my father who is almost 80 just notified me yesterday that my brother (whom I have only met twice) that lives in Florida won't stop pushing him to move to Florida. He will be leaving in 4 weeks! He doesn't want to go but he's going to anyway. I am extremely torn up as I know I won't be able to see my father again. My father had TONS of old photos from the 1930's and up of his family. I would love your Linda's Antiques Collection so I could make him a wonderful album he could take with him filled will all of his life memories. I love all the produce in the Garden Fresh kit. I love the vintage look of a lot of your kits. I love Spring Fling. Just love all the flowers. Bunnies and butterflies are also my favorites. Celeste, I adore all the kits I've gotten created by you. If I have to pick one it would have to be 'Old Country'. I am looking forward to working with many more of your kits. Thank you for making it easy to scrap memories. Hi Celeste, all of your kits are really beautiful. My favorite is love 2 sew cause I love to sew lol. Thanks for the chance ! It is so hard to choose my favorite because I like all your kits. I would say any kit that has gardening, fairies, or mythical would be my first choice. All your kits are wonderful! If to choose I say the Egg-stra special easter is super cute and ALl boy kit. I just really adore 'Old Country' with all the antiques, bird cage, clock, and it's rustic look. I love your kits!! Thank you so much for the chance to win! I love the Egg-stra Special Easter kit. Shelby's Farm looks pretty awesome! Thanks. For reasons I wrote on your FB page my favorite is "Antiquities" and believe me this was hard to do since we could only pick one. Grannie's Treasures, New Year, and Southern Magnolias have been my favorite. You are very generous, Celeste, and it is a pleasure working with you! I love Space Cadet! So fun. Wow, this is so nice of you, especially after all the free kits you have given to us already. The one kit that stands out to me is Egg-Stra Special Easter. It is just so Eastery and springy. The colors are so perfect and love all the elements. Makes a great Easter page for my grandchildren. Celeste - I love your kits it's very hard to chose just one. Right now I'm doing the 2013 C2C and scrapbooking a Disney trip. I love the Safari Kit - it is fun to work with and I love the elements. thanks again for such a lovely way to win a great prize. Choosing is always difficult because all of your kits are amazing. Right now, I'm torn between Holly Jolly Christmas that I've wanted and Safari...either one would be a great addition to my collection of TBAB kits. Being a military family with a son currently serving in the Marine Corp., I love the patriotic themes especially the God Bless Ewe kit! Wow , featured designer!! Congrats! I am so glad to see Celeste as a featured designer here again. I love all that she does for the scrapping community. She is so generous and amazingly talented. Anyhow, it's hard to choose a favorite but I like antiquities, Love You, Friends and too many others to mention. Celeste has too many kits to mention just one. Due to Easter I would have to say I love Jelly Bean Junction. Thanks for the chance to win. I have many favorites, but "Linda's Antiques" is at the top of the list....and it is my Mom's name! Thank you for a chance to win. I just recently bought the Lil princess mini kit and the Girlie Girl kit. I LOVE those glitter papers. The bright pinks and "sparkly" papers really fit the personality of my oldest daughter. Looking through your kits I saw the FBD series Love to Dance and that is on my wish list since my daughter dances and LOVES pink:) Great designs! I just posted about the Girlie Girl kit but did not put my name... Oops! I love your stuff Celeste. Thank you for the chance to win! I'm torn between Welcome Home and Cooking with Grandma. I'm so happy for a chance to win something from your shop. My favorite kit would be Sports Lover. I have 7 grandsons and 2 granddaughters, all of whom are in sports, so I'm sure that kit would be used a lot. Can't really choose a favorite kit. On any given day... Today's favorite, though, would have to be "Going to the Movies" - I don't know why - I rarely go to the movies but I love that kit. Can't thank you enough for all the great ways you take care of all of us - I know that can't be easy. And all that is in addition to the great design work you do. Hi Celeste, Congrats on being the feature designer..my favorites of your stuff is the Merry christmas photobook, the Sports lovers and Shiver me Timber...they were top on my wish list but thanks to the 30% coupon I got them today...but my wish list is always growning after going the rest of the kits and photobooks I found Girlie Girl, Walk for a Cure And HOPE which will be great for our 3 Day walk in Philly in Oct. Diva Girl and Girls Photobooks There really is just to much to list. I just have to keep adding to my collection. Thanks! I love all your kits, but I am lucky enough to win, I'd pick Sports Lover. My girl loves softball, and this kit would come in handy! Thanks for the chance and congrats on getting the spotlight, you deserve it. They are all so adorable it's hard to pick only one but I will say "Word Charmes" is one of my many favorites. Wow! Very generous prizes, Celeste! I love anything with my fav combo....lilac and green. But you have a lot of beauties!